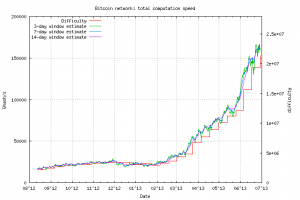 As I mentioned many times on previous blog entries, BTC Bitcoin level of difficulty increase dramatically, for many miner it’s no surprise because the actual hardware for mining has been shipped and will continue to ship. 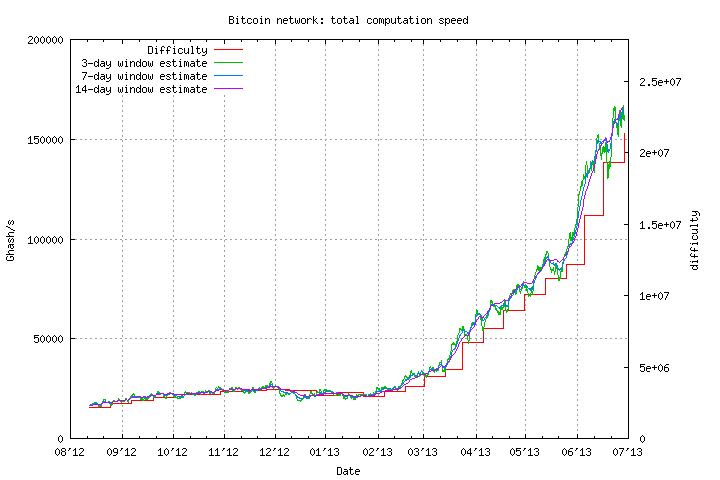 Further more, on top of that, more Bitcoin Asic manufacturers are aiming for a much higher hashing power than what today being offered by Butterfly lab (BFL) or or similar manufacturer, forget about mining Bitcoin with USB eruptor tha mine at 300mh/s per piece it’s nothing compare to Butterfly Lab Jalapenos which had been shipped and aiming to complete all backlog by September this year 2013. If you haven’t quit GPU mining yet, I don’t know why, but it’s clearly GPU mining no longer profitable, you would be loosing money big time paying for electricity, for those that get free electricity, as I mention it’s better be small amount, otherwise someone will find out and you will be in bigger trouble. This entry was posted in Bitcoin (BTC), Computers, Finance, Science by admin. Bookmark the permalink.